Or 6 payments of $28.33 What's this? This contents (pressure) gauge is a brand new, very accurate gauge from Apeks which uses an internal Bourdon pressure measuring mechanism to provide clear information on the gas contents of your cylinder. 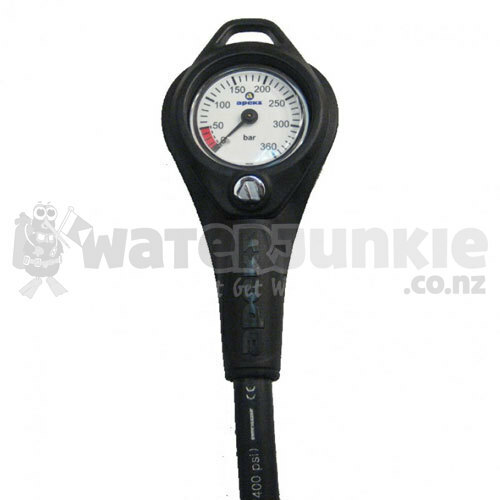 The contents gauge has a range of between 0 to 360 bar (metric) and a dial with large black figures on a luminous background which makes reading easy, even in poor lighting. Apeks have constructed this slim line, compact gauge from a nikel plated brass case and comes with specially designed housing which protects the gauge against damage and this also includes a large loop area for easy attachment. A high pressure hose is fitted to this pressure gauge and a dial window is constructed from a highly shock resistant material. An over pressure capsule is fitted on the back of the module to prevent the screen from exploding in the rare chance that the internal mechanism fails. This gauge fulfils all safety requirements according to EN 250.